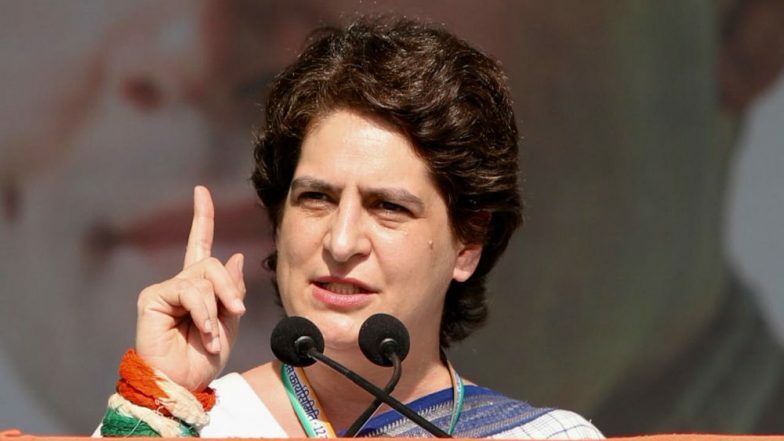 Lucknow, March 25: Ahead of Congress general secretary Priyanka Gandhi Vadra's proposed visit to Ayodhya, the BJP Monday took a dig at her and asked if she would "say sorry" there for her party "putting hurdles" in building the Ram temple. "Will Priyanka Gandhi Vadra take the pious Saryu river waters in her hand there and atone the sins committed by the Congress in Ayodhya?" asked UP BJP spokesperson Chandramohan. The newly-appointed Congress general secretary for eastern Uttar Pradesh is slated to visit Ayodhya on March 27. "Will she say sorry for the hurdles created by the Congress in construction of a grand Ram Temple in Ayodhya?" he elaborated further. Chandramohan claimed the devotees of Lord Ram and the people of Ayodhya want to know how come the general secretary of the party which has been doubting the existence of Ram setu is visiting Ayodhya -- the birthplace of Lord Ram. 'Ram Temple Dispute in Ayodhya Can be Resolved in 24 Hours', Says UP CM Yogi Adityanath. "Her (Vadra's) visit to Ayodhya will become more relevant if she expels Kapil Sibal from the party before embarking on the tour," he said. Sibal had sought the deferment of the adjudication of the title suit on Ayodhya land dispute in the Supreme Court beyond the 2019 general elections.